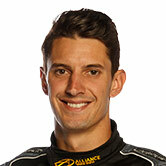 Local boy Nick Percat has won his first solo V8 Supercars race in a rain affected Clipsal 500 Adelaide. 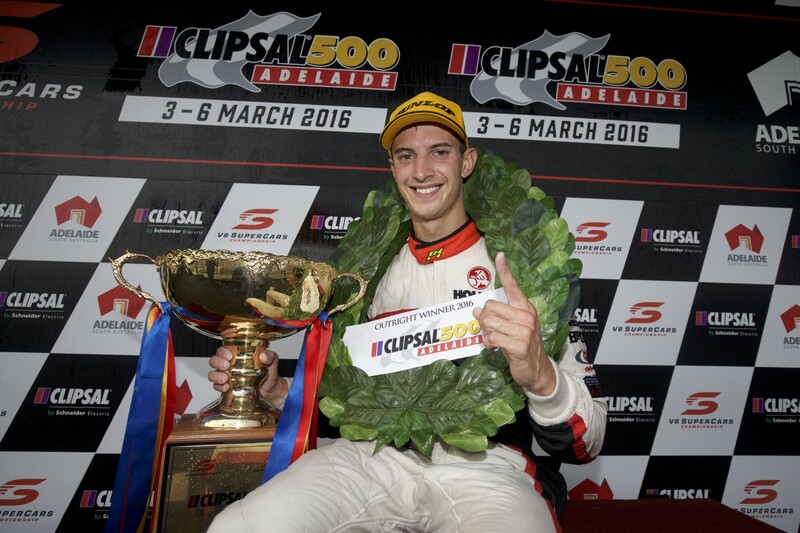 The 27-year old South Australian crossed the line first in a complicated race that came down to Lucas Dumbrell Motorsport making the right call on fuel and Percat keeping it clean. Percat won the Supercheap Auto Bathurst 1000 with Garth Tander in 2011 at the Holden Racing Team, but this is the first victory since joining the category full-time in 2013. The victory is LDM’s first win. “This is unbelievable – I’ve watched this since I was in a pram. Oh my god,” Percat said at the end of the race. Percat raced pole man Coulthard home at the end of the race, though the DJR Team Penske Falcon had not taken on the required amount of fuel and the team had lost power in the garage. Each car must take on a minimum 140 litres of fuel during the race, even if it fails to reach full distance. Coulthard did not and he, amongst others, was given a 30-second penalty. That pushed him back to 14th. Michael Caruso of Nissan finished second, with Garth Tander third in a bizarre race that had the drivers scratching their heads. Tander acknowledged his crew’s call to focus on achieving the minimum fuel drop, and was pleased to see his former co-driver take the home win as his first. “I still don’t know really what happened there… our thing was really fast in the wet but I had no windscreen wiper so couldn’t see,” Tander said. Teams had been preparing for scorching temperatures, but the rain started while cars were lining up on the grid. Most teams immediately changed to wet weather tyres but a handful headed to pit lane – including defending champion Mark Winterbottom. There was uncertainty over the start as well as the finish, with cars starting behind the safety car after a delay and some heading straight to pit lane for fuel. Slipping and sliding rearranged the order many times, and there were casualties in Chaz Mostert and James Courtney who both ran at the front of the field. Lightning struck and the race was red flagged on lap 42, which was when the minimum 140L fuel drop came into question. Restarting shortly after, cars dove into the pits on the first lap with only a handful having all fuel in hand. There were five minutes remaining and it became clear the SP Tools backed LDM Commodore was the leader. Young gun Cameron Waters came home fourth with David Reynolds and Todd and Rick Kelly behind. Winterbottom was ninth, with Craig Lowndes 13th and Jamie Whincup 16th. 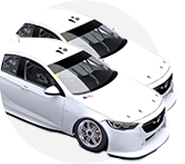 The V8 Supercars race again in under a fortnight’s time for the non-championship event, the 2016 Formula 1 Rolex Australian Grand Prix.